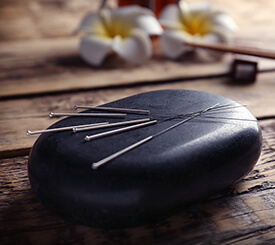 Acupuncture has been used in East Asian medicine for thousands of years to produce a healing response by focusing on energy points in the body. At Pet Health, the integration of acupuncture into a pet’s treatment plan specifically focuses on the anatomical points and physiological studies helping define the field of acupuncture. Using this evidence-based approach, we believe acupuncture can successfully be incorporated into many of our pet patients’ treatment plans, including the treatment of musculoskeletal, skin, gastrointestinal and respiratory problems, as well as pain management. We understand that good acupuncture experiences lead to repeat sessions, which in turn lead to better outcomes. Thus, both the pet parent’s trust in the acupuncturist and a pet’s comfort during the acupuncture therapy is imperative. At Pet Health all of our acupuncturists are licensed veterinarians trained at CuraCore Integrative Medicine and Educational Center under Dr. Narda Robinson. In addition, our acupuncturists perform all therapy sessions in our newly remodeled therapy room, complete with aromatherapy, a soothing water feature, and relaxing music to calm your pet.